Chances are you have already utilized this in the kitchen without knowing. When eggs or milk are used for glazing, they act as a protein source for the Maillard reaction, giving a nice brown color. Milk also provides lactose which is a reducing sugar. You’ve probably also observed that temperature does influence browning. Water content is indirectly related to temperature – as long as there is water present, temperature will stay below 100 °C. But once the bread crust dries out the conditions are just right to get the Maillard reaction running. The same principles are applied to microwaveable pies. The microwaves primarily interact with water and hence only bring the temperature up to the boiling point of water. In order to get sufficient Maillard productcs at these temperatures reducing sugars and amino acids are added to the crust (as exemplified in this patent where dextrose and whey solids are used). Not so surprisingly there is also a patent on how to avoid excessive browning in cookies which calls for addition of a polycarboxylic acid ester to lower pH and hence slow down the Maillard reaction. Pretzels are an extreme example of how the Maillard reaction can be tweaked. 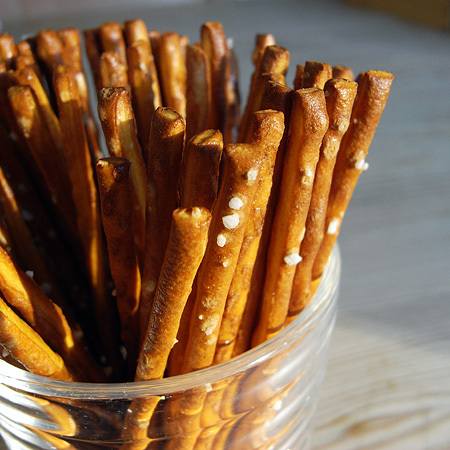 Before baking the pretzels are brushed with lye, a dilute solution of sodium hydroxide, which is very basic. 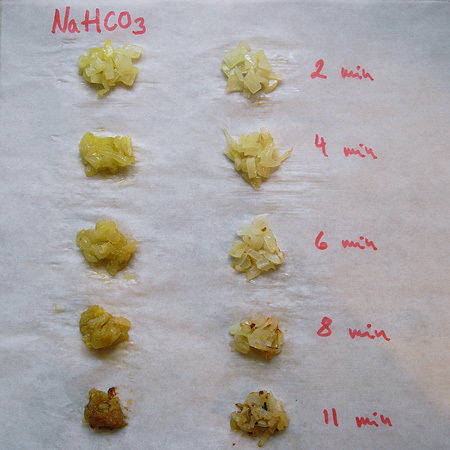 The high pH speeds up the bottleneck of the Maillard reaction (see end of post for details). Another basic ingredient found in most kitchens is baking soda (sodium bicarbonate, NaHCO3). It’s used as a leavning agent which requires addition of an acid to function. Since it is a weak base, it can be used to increase the pH and hence the speed of the Maillard reaction, for instance when browning onions. This basic task, which isn’t always so easy after all, benefits greatly from a pinch of baking soda (and surprisingly it seems that this hasn’t been done before!). To illustrate this I’ve made a time lapse video of chopped onions being fried with and without baking soda. The frying took 11 min, but things are speeded up about 10x. Samples taken throughout the experiment are shown in the picture below. Even after 4 min there is a visible difference. After 11 min, the small addition of baking soda has yielded onions which taste remarkably sweet with strong caramel notes, compared to the control which tastes like fried onions. Another example of how baking soda is used to speed up the Maillard reaction is dulce de leche, a popular sauce/caramel candy in Latin America. It’s made by slowly boiling sweetened milk. Baking soda is not a required ingredient, but is often included. The baking soda gives dulce de leche a darker color and also contributes to the flavor. Photo by audinou from flickr.com. It should perhaps be added that baking soda is frequently used in Chinese cooking, for instance in tempura batters and marinades. Once there, the baking soda will certainly speed up the Maillard reaction, but it also affects the texture of meat – I’ll have to return to that topic later. To round of this post I will briefly touch upon one of the reasons why pH influences the Maillard reaction. The first step involves a reaction between a reducing sugar (depicted as R(C=O)H) and an amino acid (depicted as R’NH2) followed by loss of water to yield a Schiff base. The Schiff base rearranges to the Amadori product (not shown). Of these first steps the formation of the Schiff base is the bottleneck (rate limiting step). The reactivity of the amino acid is influenced by the pH. A simplified reasoning goes like this: At low pH the amino group is protonated, yielding it less nucleophilic. At higher pH, the nitrogen becomes more nucleophilic and at very high pH the amino group can even be deprotonated. It should be noted that the fate of the Amadori product is also in large determined by pH and hence pH will affect more than just the rate, but this is far beyond the scope of this blog post. Finally, a new post (I guess parenting takes it’s share). Interesting stuff, although most of it is beyond my comprehension. That’s a fine discovery–I wonder if more or less bicarbonate would be needed for for sweeter or younger onions? I guess there would be a larger amount of water present to complicate things. Would a bit of tartaric acid be enough to slow down browning in situations where you don’t want brown onions (but don’t want to add more liquid like vinegar)? I realize that you are giving a simplified explanation for the effect, but I have a chemical quibble with the invocation of the deprotonated amine at the very end–bicarbonate is much too weak a base and the neutral amine much too weak an acid to produce the amide anion at any appreciable concentration. I would guess that the higher concentration of free amine at higher pH would probably be good enough to lead to the observed acceleration? Wow, really excited about this. This is significant Martin! Potentially as valuable and practical a technique as anything I’ve read from Herve This. One thing I hypothesized from the video was that speeding up the process may also lead to better predictability of results, more consistency maybe? The side without the baking soda would presumably get to the same result eventually if not, but the side with baking soda seemed homogenously browned while the one without was more varied in color at the 11 minute mark. I’m curious if you have any thoughts on ratios or if you think there may be any undesirable side effects, nutritionally or otherwise. Lye on pretzels eh? This blog is a wealth of information! Barney: I haven’t experimented much with varying the amount, but you might be right about the water. Tartaric acid should be tried – theoretically it should slow things down, but this chemistry is complicated. And regarding the mechanism: I included the amide anion since the concept of a nucleophilic attack is often easier to understand with an anion than with a lone pair of electrons 🙂 Of course with baking soda there will be no such amide anion present. At one point I also thought I should skip the last part with the mechanism – simply because there are so many reactions involved that are pH dependant. But the book “The Maillard Reaction” by Harry Nursten mentions that the first step is in rate determining, so I thought I’d include this. Steve: The end result of the side without baking soda will not be like the side with baking soda. Just think of the interplay between water evaporation (which translates to temperature), pH and time – the onions without baking soda will become drier before they brown. Another thing which I actually forgot to mention is that baking soda can also weaken the cell walls and ultimately disrupt them (this occurs if you add baking soda to the water when boiling greens) – this frees the “juices” at an earlier point and gives the Maillard reaction more starting material. So what about Sous-Vide’in a steak, would I marinate the steak in Milk? then take it out and give it a quick sear to cause Maillard but not increasing internal temperature? Further to Westons query – could we alternatively give the sous-vide steak a light dusting of baking soda before torching with butane for the maillard reaction? We are trying to go deeper into Maillard in differnt recipes; in fact, we’re trying to modify the final volatile profile of different foodstuffs by adding different Maillard precursors, mainly aa and sugars. But the baking soda way is really an easy and interesting idea. By the way, Weston, a reducing sugar on the surface of the steak will rapidly develop colour once in the pan. Yum! Got to try some of these myself. Martin, I’m afraid I must nitpick on your experiment: I think it lacks the proper control to be valid. I imagine the addition of baking soda will increase the osmolality of the environment and ease the breaking of the cell walls (you mention it yourself – you think it’s a specific effect of soda, or just an osmotic pressure thing?). A proper control would have been onions with some other salt added, one that’s neutral or a weak acid. And doesn’t affect taste. Some recipes call for salting onions before cooking. In a recent experiment at his Paris lab, French food scientist Hervé This confirmed that salting does lead to better browning, though he was not able to determine why it works. Perhaps it’s because the salt draws water from the onion, and that water contains sugars. So the question is: does salt only help to draw out water by osmosis, or does salt also contribute to the cell wall damage? Regarding the experiment my guess is that in a comparison of salt and baking soda one would see a larger effect with the latter. Fascinating stuff, really really wonderful. Thanks for stopping by the blog and introducing me to your work. Can’t wait to read more. Especially since I always cook onions slow at low pH… This because I presumed you get better hydrolysis of inulin chains under acid conditions. Release of fructose or fructose oligomers from inulin does give cooked onions the sweet flavour so I am wondering whether this acually works better at higher pH as well. Should I salt onions during sautéing or after sautéing? …each cook has a different opinion on the appropriate salting time when sautéing onions. Putting aside any preconceived notions, we set out to get to the bottom of this simple but vexing issue. 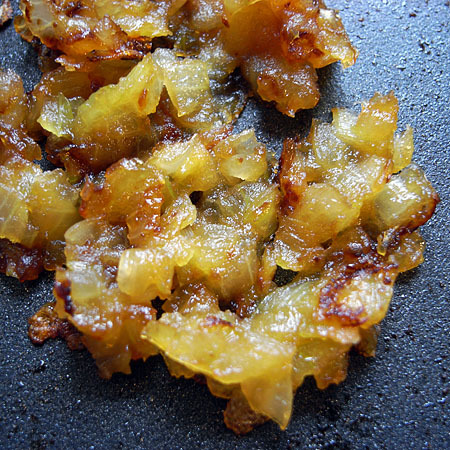 We started by sautéing 1 cup of diced onions in oil in a medium skillet over medium heat. After 6 minutes of frequent stirring, the onions were beautifully golden. After removing the onions from the skillet, we added 1/2 teaspoon of salt. Tasters loved the caramelized flavor but commented on the crunchiness of the onions. They also pointed out that the onions weren’t seasoned throughout–only on the surface. Next, we kept the stove on the same setting and sautéed a second cup of diced onions, this time adding 1/2 teaspoon of salt at the outset. After 6 minutes, the onions were not as brown as the first batch had been, so we cooked them a few more minutes until they were golden brown. When we tasted these onions, they were meltingly tender and well seasoned. The salt had drawn out their liquid, causing them to soften as they cooked. But the liquid also caused the onions to brown more slowly, tacking a few extra minutes onto the cooking time. So the controversy is over: Salt onions when they go into the sauté pan, leaving them over the heat for as long as necessary for decent browning. I would be interested in a repeat of the baking soda experiment involving salt as well. If salting the onions at the beginning causes them to brown slower, but more satisfactorily, does the baking soda make up for the difference? This illuminates why the America’s Test Kitchen recipe for crispy skinned roasted chicken calls for smearing the skin with baking soda. Harold McGee has an interesting article in his “Curious cook” column in NYT on persimmon puddings where baking soda is added and where the resulting color of the pudding depends on the amount of baking soda added, which influences pH and of course the speed of the Maillard reaction. Any plans to expand on this soon? Try adding a pinch of bak­ing soda to onions when you’re car­a­mel­iz­ing them. Sounds crazy, I know, but it works.